XBOXONE-HQ.COM's YouTube channel features hundreds of Ultra HD 4K and High Definition 1080p/60fps gameplay from some of the most popular and upcoming Xbox One games including: The Crew 2, Battlefield 1, Battlefield 4, Battlefield Hardline, Tom Clancy's Ghost Recon Wildlands, Star Wars Battlefront, Star Wars Battlefront 2, Tom Clancy's Rainbow Six Siege, Grand Theft Auto V (GTA5), Far Cry 4, and ID@Xbox Games like PUBG - PlayerUnknown's Battlegrounds, War Thunder, Fortnite, Friday the 13th: The Game, Thimbleweed Park and Verdun. Already a HQ Network user?? All XBOX-HQ.COM users can login on XBOXONE-HQ.COM using the same username and password. 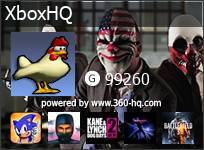 Come and introduce yourself on the Xbox One Forum.